This is a ‘what I did on my vacation’ post. I went to London over the Christmas holidays, intent on certain goals: shopping, shopping, and if time allowed, shopping. In addition, I wanted to make the most of all the research I had done over the months leading up to the trip, to have fun in very non-touristy ways – bingo at the Underground Rebel Bingo Club, an Eve Lom facial at SpaceNK, and the Francis Bacon exhibit at Tate Britain for example. Well, best laid plans, blah blah blah. Crowds, closings and general inertia limited my nights out, and I did not manage to tick anything off my to-do list. Apart from shopping – I did do a bit of that. We enjoyed our London Christmas very much, but there were some lessons I learned that will help me make the most of future visits. Christmas shut everything down, apart from public transportation. That wasn’t surprising, but Boxing Day wasn’t much better. The only shops open then were pretty much limited to Oxford Street and Regent Street, and museums and many restaurants were still closed. Next time I’m inwardly cursing the crowds on Buchanan Street, I’ll remember the feeling of forcing my way down Oxford Street on Boxing Day. At one point moving forward was completely impossible. I imagine it was a feeling similar to being a slice of banana suspended in jelly. Not one I would like to repeat. And by Liberty, I don’t mean personal freedom. I mean, of course, the magnificent Tudor style department store on Great Marlborough Street. Far less crowded than the likes of Harrods and Selfridges, it was like a quiet, lovely, museum of beauty. The highlight for me was the Omorovicza counter. Omorovicza hails from Budapest, and boasts Hungarian thermal waters and some other reassuringly scientific sounding ingredients. Try the Rose Lifting Serum, which actually smells of toffee and will make your skin look taught and glowing, and the tingly shaving cream, which will leave your skin feeling very soft. The sales woman was very nice and gave us loads of free samples. Currently, the line is only available in a limited number of stores (mostly in England), but it can be purchased online from Harvey Nichols, Urban Retreat, or Cult Beauty. Aside from being the least crowded bit, the basement also has the fine wine room, which makes for a fascinating browse, and the pharmacy. The pharmacy is much better than the beauty department upstairs, and sells a range of products from appetite suppressant gum to those detox pads you can put on your feet. And the best part is, even during the busiest shopping day of the year, there’s hardly anyone down there. 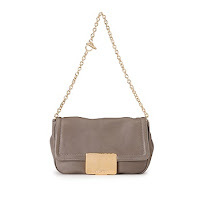 Incidentally, Harrods still has some sale items available online - check out their collection of gorgeous Halston handbags. Some of the best discoveries I made in London were found when things didn’t go according to plan. For example, Berwick Street Market was reduced to a single fruit stand on the Sunday after Christmas, but that left me an unmarred view of all the amazing record shops that line the streets of Soho.